Public ownership that puts people first. We're making the case for democratic public ownership of key national assets including railways, energy and water. From 1979 onward, Conservative governments began selling off the nation's publicly-owned transport and utilities, bringing them under private control. As shares in the newly-privatised companies went on sale, Thatcher's government promised an 'ownership revolution', in which we could all own a stake. The sale of British Gas shares in 1986 was accompanied by a TV advertising campaign, in which the fictional character 'Sid' was urged by his friends and neighbours to invest at "affordable" prices before the deadline. Shareholder democracy? Not so much. Although millions did indeed sign up for the new shares, many of these new shareholders “stagged” their share issues, selling them on at the end of the first day’s trading for a decent profit. Levels of individual share ownership have continue to fall, with an increasing share of the privatised industries instead snapped up by overseas buyers- often at bargain prices. Far from introducing greater competition, mergers and reorganisations have left our utilities more centralised than ever, with power shifting from a government department to just a handful of major companies which dominate each sector. What's next? It's time for democratic public ownership. We need to call time on the failed experiment of privatisation, and develop a way forward that puts people first. We do that by running utilities and rail in the public interest, and making them accountable to the public who use and work on them. Public ownership for the 21st century. 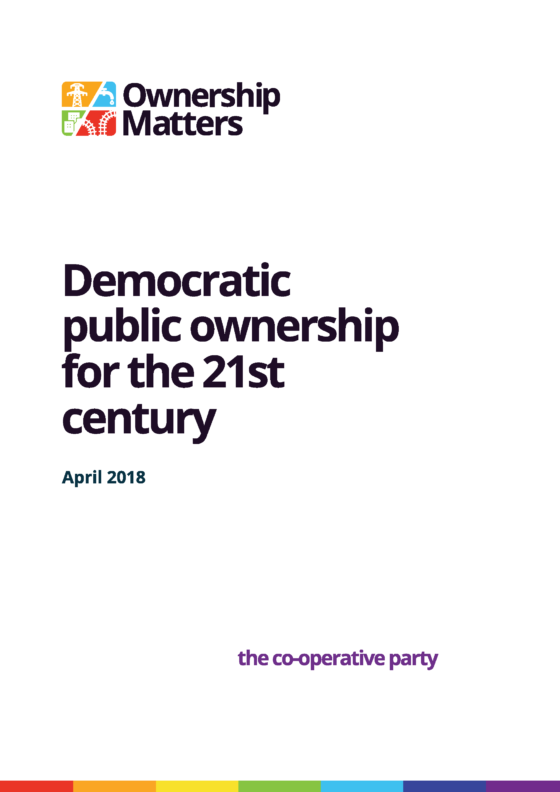 The Co-operative Party's new report ‘Democratic Public Ownership for the 21st Century’ explains how modern democratic public ownership can work in practice. Our report sets out how we can achieve democratic public ownership of water, energy and rail− putting an end to privatisation, and learning from past experiences. Fundamentally, it’s about accountability; ensuring that the voice of customers, staff and the taxpayer are at the heart of how these industries are run, and that services are shaped around the interests of the people who use and work in them. There is clear evidence of gains in productivity in organisations with higher levels of employee participation. The taxpayer, customers and employees themselves would directly benefit from these gains. Accountable governance structures can bring publicly-owned utilities into line with wider social, environmental, security and economic public policy objectives. Ownership dispersed across multiple stakeholder groups can ‘lock in’ public control and safeguard against attempts to sell or re-privatise assets. Customer and employees act as guarantors against attempts by future governments to ‘run down’ services through underinvestment. Alignment of interests and mechanisms for reconciling competing priorities. Existing models create contradictory interests between shareholders, the taxpayer, employees and customers, giving shareholders primacy.